California, Colorado, Nevada, New Mexico, and Utah. The 2017 St. George, Utah, Regional will be held Oct 28 at a location to be announced. In 2016, American Fork won its fifth consecutive regional championship. Only five returning finalists means there's a lot of uncertainty about not only placements, but who will even be competing for the final placements. There are several schools who are returning to the regional after a year or two off, and even more groups who are attending their first ever BOA regional. The one thing we're fairly certain about: American Fork will take the title. American Fork competes in 2013. American Fork has held a dominant hold on this regional since they began this winning streak in 2012. In these five years, the band has placed first in prelims and finals and has maintained a lead of over 2 points in finals each year. Clovis West is the one group that could could challenge American Fork for the title. 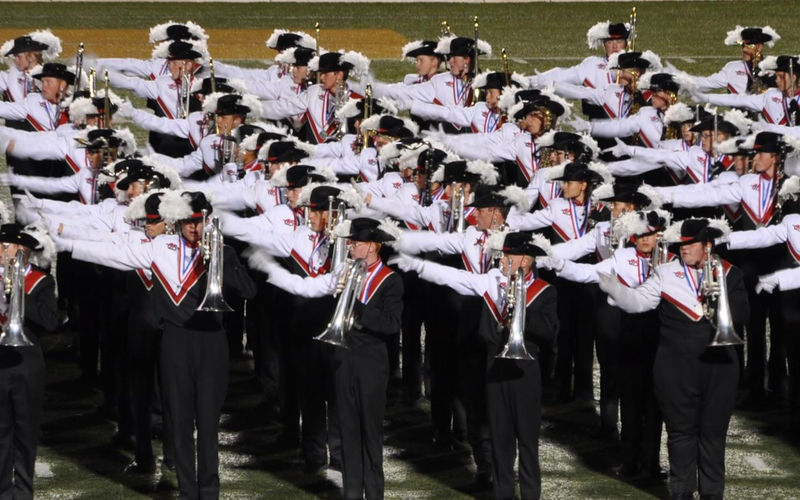 The band has a long history of success at past St. George regionals, frequently placing in the top three, and winning the regional in 2010. Most recently, Clovis West earned a narrow third-place at the San Jose Regional. Returning finalists Davis, Foothill, Sky View, and Westlake will look to repeat in the top half of finals this season. All three have been consistent finalists at St. George for several years. Loveland is making the trip from Colorado this year. When Loveland last attended in 2015, they earned fifth place. Arbor View, Etiwanda and Lehi also last attended in 2015. Arbor View and Etiwanda placed eighth and seventh in finals, while Lehi finished 11th in prelims, just outside of finals. Los Osos competed at the Long Beach Regional the past two years, finishing ninth and tenth in 2015 and 2016. We’re curious to see how that placement at Long Beach will translate to Utah. We’re expecting a higher placement in St. George, but there’s no guarantee. Clovis returned to Bands of America events this season after taking a three year gap. They’ve previously had success, making finals at St. George many times before taking a gap from BOA. Just a few weeks ago, the band placed fourth at the Midland Regional behind some incredible bands. Finally, Green Canyon is a school to keep an eye on. The school just opened this year, splitting from consistent finalist Sky View. With strong talent at both schools, we could see both in finals within a few years or maybe even this year. Music: George Boulden, Dave Branson, Glenn Fugett, and Scott Koter. Music: Jackie Gilley, Bruce Jones, and John Turner. I would suggest doing a little homework. Green Canyon's director is the former director at Sky View and he took his entire staff with him to the new school. They had been placing consistently at the top of the 3A division in Utah all year, while Sky View had been placing well below them and everyone in Utah knew that if either school would make finals it would be Green Canyon, and that Sky View, as good as they have been, had little shot at making finals this year, though it was not a sure thing that either one would. So predicting Sky View to place 8th, especially ahead of Etiwanda, makes little sense. It is also a little maddening to read things like "We’re curious to see how that placement [of Los Osos] at Long Beach will translate to Utah. We’re expecting a higher placement in St. George, but there’s no guarantee." There is "no guarantee" because the St George regional is just as good as that of Long Beach (or Northern California) and S Cal, and has been for a few years. If you were to take American Fork, Foothill, Clovis, Loveland, Davis, Westlake and put them all in any CA regional, north or south, they would each make finals and Ayala, as good as they are, would have a battle with American Fork. This is not a dig on the CA bands at all; Upland, Vista Murrietta, San Marcos, Hart, Saratoga, Homestead, Clovis West...All great bands with wonderful traditions. But they wouldn't just walk over the competition here in Utah. The year Westlake went to American Canyon (2015 N Cal regional that year) was the weakest they had been for the past several years, with a majority freshman and sophomores. Take their 2013, 2014 or even 2016 shows to that regional and they place top 3, if not outright win it with either their 2013 or 2014 shows. Just asking that you pay a little more attention to the St George regional and give us here a little more respect...especially when the band you predict as the "one group that could could challenge American Fork for the title" placed 3rd in a CA regional the week before placing 9th in Utah.